Review by AllTheBestFights.com: 2015-06-12, disappointing and one sided fight: Erislandy Lara vs Delvin Rodriguez gets two stars. The 2005 world amateur boxing champion Erislandy Lara entered this fight with a professional boxing record of 20-2-2 (12 knockouts) and he is ranked as the No.2 super welterweight in the world. He fought twice last year losing to #1 Saul ‘Canelo’ Alvarez (=Alvarez vs Lara) and winning over Ishe Smith (bout valid for the Wba belt, Lara vs Smith). His opponent, Delvin Rodriguez, has an official record of 28-7-4 (16 knockouts) but he is not ranked as he hasn’t fought since May 16, 2014 when he drew with Joachim Alcine (=Rodriguez vs Alcine); before this fight he had lost to Miguel Cotto (=Cotto vs Rodriguez). 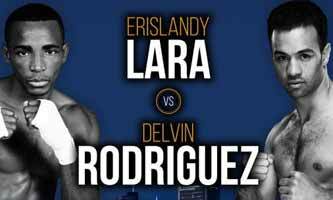 Lara vs Rodriguez is valid for the WBA and vacant IBO World super welterweight titles. Watch the video and rate this fight!